To paint with a loaded brush I mix a series of colors of similar values. If I'm painting a sky I mix up at least three patches of color that when combined are very similar, but not identical, in value to the sky I am painting. I mix a blue that is a little bit yellowish (white, thalo blue, and cadmium yellow light). I mix a blue that is a bit reddish (Cadmium red, indanthrone blue, and white) and a blue of equal value as the other mixtures (titanium White with indanthrone blue). If I want the sky to really shimmer I might mix up two blues. One warm, like a thalo blue, and a cool blue like indanthrone, again, both of similar value. I demonstrate this technique not because I insist it is superior but to demonstrate a very controlled method of getting a variety of paint on the brush. It may seem complicated but if you rely on swiping your brush through a messy palette to get variegated color you will probably be disappointed. 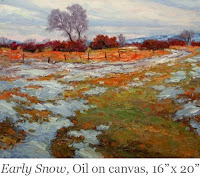 It isn't necessary to paint every stroke using such a controlled method but it is extremely useful in painting areas that need energy and vibration like foliage, skies, roads, or any main point of interest.